Although the project of Aaron Shanahan is relatively new, he has in fact spent over half a decade performing, writing and collaborating as part of many well-known musical outfits. Most notably, Aaron was the guitarist/vocalist/co-producer for indie dance act Miami Horror, before becoming one half of the Australian psychedelic duo Wunder Wunder. Having independently releasing two singles in 2016 'Waiting For You' and 'Only', Sunday has already seen support from renowned press outlets NYLON and Billboard. In the first few years of the project's existence, Aaron has toured with the likes of Phoenix, Crystal Fighters, Washed Out, Empire of the Sun, and collaborated with Goldroom, Gigamesh, Saint Lou Lou,and George Maple. 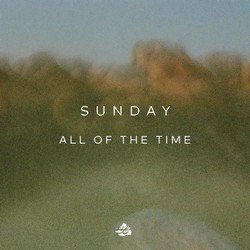 On hearing the new single 'All Of The Time', the progression of his career to date, and the laid back, psychedelic rhythms, all seem to intertwine at a perfect juncture.